The trolley is designed for measurements of track geometry. The readings are recorded automatically in an electronic memory in real time, as the trolley travels along the track. The operator can see the measured values of the track gauge, cant, and the actual mileage on the display during the measurements. The large size foil keyboard makes it possible to enter information on track faults found. One can mark locations, e.g., of the broken weld or rail, the need to replace the sleeper or missing bolts. Software supplied with the track gauge makes it possible, among others, calculation of the track gauge gradient, track twist, and recalculation of the measured vertical and horizontal irregularities to 10 m long chords. Tabular printout of the measurement results is possible, with marking the mileage values where faults observed by the operator occurred, printout of the measurement results as plots, and also calculation of the synthetic indices according to regulations of the Polish State Railways, Hungarian State Railways or Dutch Railways – for evaluation of the track geometry quality. Delivery of the software for processing the track gauge measurement results according to requirements of other railways is also possible. 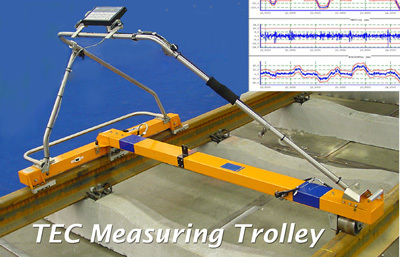 The main advantage of the TEC-1435 track gauge system is its capability for evaluation and visualization the measurement results in a similar way to the one employed by geometry vehicles. The gauge has many operational advantages. Low weight (about 20 kg) makes fast removal from the track possible to let the train pass, next, immediate continuation of the measurements is possible without any calibration. The track gauge may be folded easily and transported even in a small car. The gauge’s electronic memory can store up to 15 km of the track length measurement results, which is equivalent to the single shift measuring capability of the gauge. Software for the PC platform, supplied with the track gauge makes it possible, among others, calculation of the track gauge gradient, track twist, and recalculation of the measured vertical and horizontal irregularities to 10 m long chords. Tabular printout of the measurement results is possible, with marking the mileage values where faults observed by the operator occurred, printout of the measurement results as plots, and also calculation of the synthetic indices according to regulations of the Polish State Railways, Hungarian State Railways or Dutch Railways – for evaluation of the track geometry quality – see figs 3÷5. The main advantage of the TEC-1435 track gauge system is its capability for evaluation and visualization the measurement results in a way similar to the one employed by geometry vehicles. the PC platform. The track gauge user can select parameters, at his discretion, which plots should appear on the same page (max four plots). The plot demonstrating occurrences of events (e.g., switch, semaphore, bridge, etc.) and track defects (e.g., missing bolts, flash, skewed sleepers. etc.) is very important, as it is a precondition for the rational interpretation of the measured track geometrical parameters. 1. Listing of numerical values. 2. Synthetic assessment of the track geometry. a. Crossings located between 15.200 and 16.000 km affect significantly the quality assessment. b. Track geometry errors are visible in the plots at both ends of the transition curve. c. Side wear of rail heads is visible in the curve.